Deserving of more awards attention than it’s received, Inside Llewyn Davis – Joel and Ethan Coen’s follow-up to the very different True Grit – is a very heartfelt and rich piece of cinema, perhaps even one of their best. Melancholic and somber, yet imbued with a tremendous amount of heart, insight and humour through its realistically flawed central character and soul-stirring use of folk music, this is one intoxicating parable that shouldn’t be missed. Llewyn Davis (Isaac), one half of a now defunct folk duo, has hit a brick wall in life. Living from couch to couch with barely a dime to his name, he survives through the reluctant favours from others – husband-wife folk act Jim (Justin Timberlake) and Jean (Carey Mulligan), in particular – and the odd pay cheque here and there. With little sign of betterment, he ventures to Chicago, entertaining the idea of scrapping it all and re-enlisting in the Merchant Marines. Set against the backdrop of the mid-1960s American folk music revival, which is captured perfectly by cinematographer Bruno Delbonnel, Inside Llewyn Davis is at first a tough nut to crack. 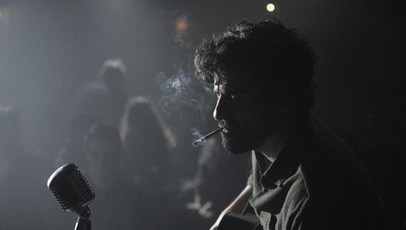 But as the narrative unfolds – and the many layers of Llewyn’s personality are peeled back to reveal a realistically flawed everyman – it takes on a much deeper quality as an insightful portrait of someone stuck in a rut, unable to catch a break, no matter how hard they try. Isaac inhabits this role wonderfully, capturing Llewyn’s multi-layered personality with an incredibly sincerity. His singing voice, too, is powerful, with most of his real emotion ploughed into his only real love in life: being a musician. He’s matched by performances delivered not only by Timberlake and Mulligan (the latter of which is particularly strong), but also by the two cats who accompany him on the many misadventures his struggle through life sends him on. There may not be a lot to the films narrative (it’s more amiable and interested in the smaller details than forward-driven), and the mood is inevitably somber and melancholic in order to hammer home Llewyn’s troubled, decayed psyche. But with a dark sense of humour and utterly spellbinding music, Inside Llewyn Davis works on a higher level, as a evocative character study that moves in its own way, both touching and moving the soul in the process. Great review! Very much looking forward to seeing this on Monday.